Umbria is a region who has always had a strong bond with its terrain, and a long tradition of cultivating grapes and producing wines. A bond with ancient origins, since the Etruscan and Roman civilizations handed down this traditional aptitude for finding fertile ground within pristine green hills. Most of Umbria is marked by the presence of the Etruscan-Roman wine trail, and many of the wines produced in the region are well-known and appreciated. The production of quality wines from Umbria mainly consist of Chardonnay, Grechetto, Trebbiano and Malvasia Bianca white wines, and Sangiovese, Sagrantino, Montepulciano, Merlot, Barbera and Canaiolo red wines. These are high quality wines that are subject to greater restrictions than DOC, and are also subject to additional analysis and organoleptic tests. Some DOCG wines are also declined in the Superior, Classic and Reserve typologies. Superior is attributed to those wines that have an alcohol content higher than the standard. Classic applies to older wines, and Reserve is used to define those DOCG wines subject to special periods of aging. This great wine of central Umbria is produced in the territory of Montefalco, Bevagna, Gualdo Cattaneo, Castel Ritaldi, and Giano dell’Umbria. This wine is made from 100% Sagrantino grapes and has been a DOCG (designation of controlled and guaranteed origin) wine since 1992. The DOCG label is reserved for red wine in the types “Secco” and “Passito.” Sagrantino di Montefalco is a wine with intense ruby color pairing well with game and red meats. This wine had the privilege of being the first in the Umbria region to be given the DOC (designation of controlled origin) label in 1968, which later became DOCG (designation of controlled and guaranteed origin) in 1990. Torgiano Rosso Riserva is a red wine produced in the restricted area of the municipality of Perugia in the town of Torgiano, and through a process of aging of minimum three years, acquires a bright ruby color and taste perfectly harmonious. This wine wisely uses grape varieties including mainly Sangiovese and Canaiolo. This designation applies to those wines produced in areas (small to medium amplitudes), according to certain production standards. DOC wines with this classification for more than five years may also provide the DOCG classification if the appreciation and value certificate assume an international character. Another Umbrian wine of great value and appreciation which is produced in the territory of Montefalco and the surrounding municipalities: red made from Trebbiano and Grechetto grapes (also reserve) and white made primarily from Sangiovese and a small part of Sagrantino grapes. The red wine is best with meat and game, and the white can be considered a wine for any meal. A wine produced in the center of Umbria and that got its designation in 1988. Produced in a wide area of central Umbria geographically characterized precisely by the chain of Martani Hills. It is produced in different types including the very popular white Grechetto great for meals with fish, and red Sangiovese Colle Martani (also reserve) great for red meats and game. A wine who recently acquired the designation of origin (2010) in the territory comprised in the production of the Colli Martani DOC. In particular, this wine is produced in the types: white, red, Grechetto, Merlot, and Sangiovese. This wine is produced mainly in southern Umbria in the Orvieto territory. Certified in 1971, today it is one of the best known wines in the region. It is a wine obtained from Trebbiano, Procanico and Grechetto grapes. The Orvieto DOC also includes Orvieto Classico, and is reserved for a variety of white wines: secco, abboccato, amabile, dolce, superiore, vendemmia tardiva and muffa nobile. A red wine with a newer DOC certification than the Orvieto DOC white, conferred in 1998. It is a red wine which can be combined with various types of food. It is produced in the territory of Orvieto and comes in various typologies from the following grape varieties: Cabernet, Cabernet franc, Cabernet sauvignon, Canaiolo, Ciliegiolo, Merlot, Pinot Noir, Sangiovese, and Aleatico. The Lago di Corbara was DOC certified in 1998, and is reserved for red and white wines that meet the conditions and requirements established by the product specification for the following types: red, red reserve, Cabernet Sauvignon, Cabernet Sauvignon reserve, Merlot, Merlot reserve, Pinot Noir, Pinot Noir reserve; Sangiovese, Sangiovese Reserve, white, white reserve, Grechetto, Grechetto reserve, Vermentino Vermentino reserve, Chardonnay, Chardonnay reserve, Sauvignon, Sauvignon reserve, Vendemmia Tardiva, Passito and Passito reserve. A designation acquired in 1989 which was formerly Colli Amerini DOC. This wine is produced in the southern part of Umbria and is produced as: white, red, red reserve, Grechetto, Ciliegiolo, Ciliegiolo reserve, rosato, novello, Malvasia, Merlot, Merlot reserve, Sangiovese, and Sangiovese reserve. This wine obtained the designation of origin in 1968. It is produced in the territory of Torgiano. They named different types of this DOC wine according to grape varieties: White Torgiano, Torgiano Chardonnay, Pinot Grigio Torgiano, Riesling Italico in Torgiano, Torgiano Red, Rosato di Torgiano, Torgiano Merlot, Cabernet Sauvignon Torgiano, Pinot Nero Torgiano and other special wines like Spumante Torgiano, Torgiano Vendemmia Tardiva, and Torgiano Vin Santo. This designation of origin was given in 1981, and is reserved for white, red, novello, spumante and Vin Santo. This wine is produced in the province of Perugia, in the territory marked by the presence of the region’s capitol. A wine produced in the same area as the Colli Perugini DOC, but also stretches to the west skirting the perimeter of the entire Trasimeno lake. It obtained the designation of origin in 1972. Today this wine (also found with the name of Trasimeno) is produced in different types: white (sparkling) to red (novello, sparkling, reserve), rosé, Grechetto, Merlot, and Gamay. A DOC wine since 1980 produced in the province of Perugia and extending north to the towns of Città di Castello and Gubbio. This wine is made from grapes such as Grechetto, Chardonnay, Pinot Blanc, Pinot Noir, Pinot Grigio, Trebbiano, Sangiovese, Merlot and Cabernet Sauvignon. Umbrian wine produced in the territory of Assisi and Perugia. DOC since 1997, it is obtained from Tuscan Trebbiano, Grechetto, Sangiovese, Cabernet Sauvignon, Merlot and Pinot Noir. The Assisi DOC wine is produced in different types of white, red, rosé and variations in reserve for the reds made from Cabernet, Merlot and Pinot Noir. The most recently added DOC wine of Umbria (2011). This wine is produced in the territory around the city of Spoleto and Foligno obtained from Trebbiano Spoletino grapes with various typologies: Spoleto white, Trebbiano, Trebbiano superiore, Trebbiano Spoletino Passito and Spumante. All the best table wines that are obtained in certain production areas wider than that of the DOC and DOCG wines, which permits the identification of the production area. Province of Perugia, red wines in standard typologies and produced in the territories of Bettona, Bevagna and Cannara. Province of Perugia: white, red and rosè wines. Province of Terni, white wine in the standard typologies; sparkling, sweet and young. Rosé wine in the standard typologies; sparkling and novello. Red wine in the standard typologies; sparkling, sweet and novello. Province of Terni, white wine in the standard typologies, and sparkling wine. Rosè in the standard typologies and novello. Red wine in the standard typologies, sweet and novello. 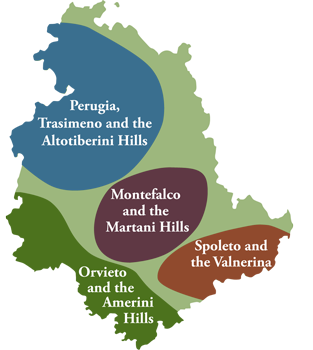 Province of Perugia, white and sparkling wines in the standard typologies; rosè (normal and novello), red (normal and novello). Produced throughout the region. White wine in the standard typologies; sparkling, sweet and young. Rosè in the standard typologies; sparkling and novello. Red wine in the standard typologies; sparkling, sweet and novello. All those wines of quality that are not categorized, but are simply labeled with the name of the bottler and their production. Their production have no particular regulations or restrictions. These are considered the wines released for consumption only after undergoing the process of wine-making (without technical intervention or subsequent additions of other components). Wines of a yellowish color in various shades (from light greenish to amber, through straw and golden), it is generally characterized by floral and fruity aromas, and should be consumed at a temperature of between 8° C and 12° C. The tastes are dominated by feelings of freshness and acidity, although with increasing temperature might arise unpleasant feelings of bitterness. They are paired best with dishes based on fish, mussels, crustaceans, vegetables and white meat, and in general with quick-cooking dishes and sauces. They come in various shades of red (purple, ruby, garnet and orange). They are generally characterized by a wide variety of scents (flowers, fruit, jam, herbs, spices) and by a more or less high feeling of softness, body and tannin. They must be consumed at a temperature of between 14° C and 20° C. They pair best with red meat, game, cheese, and all dishes with on slow cooked sauces and robust structure. These are pale pink, or light cherry in hue and generally characterized by fruity scents. They should be consumed at a temperature of between 10° C and 14° C. The prevailing taste sensations are slight acidity, aroma and slight body. They pair best with tasty dishes based on fish, pasta with delicate sauces, and light meats. These are obtained by carbonic maceration. It has a deep color and strong aromas. It should not be placed on the market before November 6 of each year. It is recommended to consume within the first six months, because they are unstable wines. Sparkling wine which follow the traditional wine-making process of white wines, monosaccharides (sugars) are added in order to cause a secondary fermentation which can take place in the bottle (or traditional method Champenois) or autoclave (Charmat). Fortified Wine obtained from dried grapes processed as a normal wine. The drying can take place on the vines or with a special shed with open sides that allows airflow. Credits Fotografici: Alcune delle foto sono di “proprietà della regione Umbria” che si ringrazia per la disponibile collaborazione.